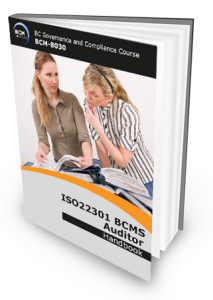 This course primarily equips individuals to audit BCM readiness using the ISO22301 standard as an internal (first, second and third party) auditor. This course is also relevant to any financial or IT auditors responsible for BCM. A BCM-ready business is highly regarded and prized as a supplier, largely because this company is deemed a reliable and sustainable partner for both the short and long haul. Becoming BCM-ready is a process businesses providing essential services to others cannot ignore, whether required as part of legal obligations stipulated in the request for proposal (RFP)/ tender, or it is part of the corporate culture and ethos of the supplying organisation. BCM Institute’s BCM-8030 internal audit course provides the audit framework that enables companies to develop and enhance their audit capabilities so as to meet its business requirement. This is primarily achieved through the equipping of internal auditors and Organization BCM Coordinators with the requisite skills, tools and knowledge to plan, control and eventually lead BCM-related audits by the requirements of ISO 22301 Standard. BC Certified Auditor (BCCA) certification is awarded to participants who successfully completed and passed the Qualifying BCCA examination attached to the course, sends in an application detailing at least 1 year of BC experience , make the application processing fee payment of SGD75 and satisfies and meets the experience requirements of the independent certification body. Have an in-depth understanding of the fundamentals for Business Continuity Management with alignment to ISO22301. Learn the principles and practices of internal audit for a Business Continuity Management System (BCMS). Walkthrough the entire audit process of people, policies and processes from managing an audit program, controlling audit activities to reporting on audit results. Able to interpret and understand the framework and audit requirement of the ISO 22301 BCM standard. Understand the function and purpose of ISO 22301, the BCM values and standards required of the company and its executives. Review the leadership and management commitment for the Business Continuity Management System (BCMS). Translate the requirements of ISO 22301 into a program for auditing BCM within the company. Understand the Element of BC Programme or BCM planning methodology with the ISO 22301, their risks and controls. Highlight the principles and practices for performing an internal audit of the BCM program and/or BCM System. Equip skill, knowledge and tools to plan, control and manage internal audits. Report results to the company’s BCM Steering Committee and/or Executive Management about the compliance to practices, or any shortfall. Internal and external auditors conducting BCM audits. Financial and IT auditors performing BCM compilance or regulatory audits. Consultants performing first, second and thrid party audit for clients. Any professionals assigned to audit or review the BCM policies & activities based on the ISO22301 standard. Employees or consultants in EHS, Security, HR, IT, Risk & Compliance functions and are new to ISO22301 and BCM. You are a business partner or service provider of essential services to any organization of which the disruption of such a service provided by you would be of catastrophic consequences to that organization. This course incorporates a 100-Multiple Choice Question electronic exam on the next day. The duration of examination is 2 and 1/2 hour. Candidates who achieve with a passing score of 75% or higher are eligible to apply for the BCM Institute’s Business Continuity Certified Auditor (BCCA) accreditation. The examination fee is included as part of the course fee. SGD75 Certification Fees are to be paid during application after participants has passed their Qualifying BCCA exam. The course fee includes the BCCA examination fee. BCM-330 or BCM-5030, DRP-300 or DRP-5000. For season auditors or BCM novice who are keen to gain a comprehensive understanding of BCM, it would be useful to attend the BCM-5033: ISO 22301 Business Continuity Management Systems Expert Implementer course. Candidate that does not have the necessary BCM experience to meet the BCCA certification and have passed the BCCA examination, will be allowed to apply for the BC Certified Planner.